Music hall star Vesta Tilley became known as 'Tommy the Trench' as she used the music hall to lure young men into volunteering for the army. Iconic music hall hits such as, 'It's a Long Way to Tipperary' are firmly placed in the public's mind with the heady early days of volunteers being recruited in 1914. Music Hall played a significant role in the war effort of 1914-18, keeping up morale and encouraging young men to sign up and fight for their country. It boasted a variety of acts from short plays, comedy sketches, ballet, magicians, acrobats and of course musical performances which took to the stage. 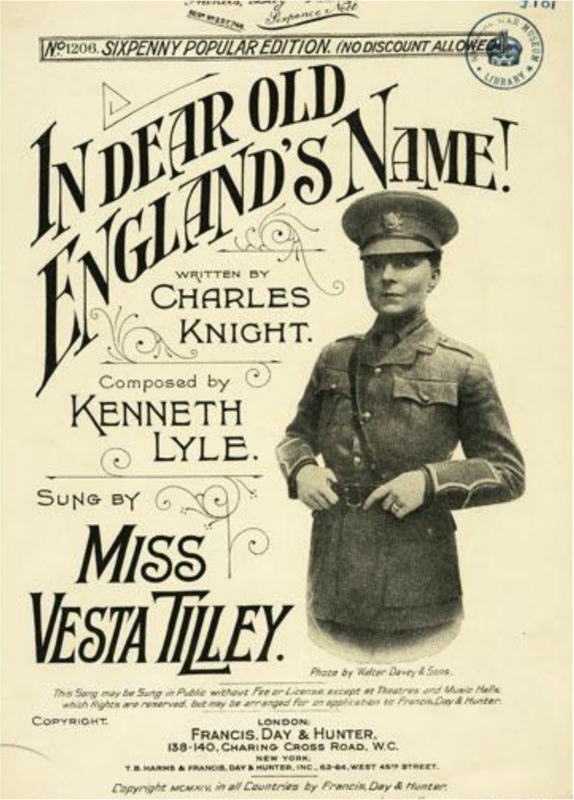 Unsurprisingly, music was what it was most known for and likewise one of its especially attractive acts was male impersonator Vesta Tilley, or ‘Tommy the Trench,’ who performed one of 30 songs especially composed in 1914, encouraging recruitment, called ‘Your King and Country Want You’. The piece was intended to push potential recruits to sign up and the pressurising lyrics, along with the presentation of a white feather – the symbol of cowardice – to the subject were they to refuse Vesta Tilley’s requests, was a particularly effective method of ensuring many men signed up. Keeping up morale was also vitally important for the war effort and the release of ‘Keep the Home Fires Burning’ in 1914 became one of the most successful wartime songs in Britain, providing an optimistic tune for a nation faced with a future of uncertainty. At the time, music was one of the main forms of entertainment for the British people as cinema was only just emerging and TV had yet to exist. Therefore, Music Hall was the place to go with more than 300 halls in London alone. Luxurious venues like the Alhambra in Leicester Square allowed working people to escape from the grind of everyday life. At the outbreak of war, it was more important than ever to raise spirits, in the light of a deadly war, which would go on to kill around a million British and Commonwealth soldiers. It wasn’t just the working class who appreciated the patriotic work of Music Hall though; the middle class who would’ve largely disassociated themselves with the mayhem of Music Hall still bought the sheet music to play in their own home. 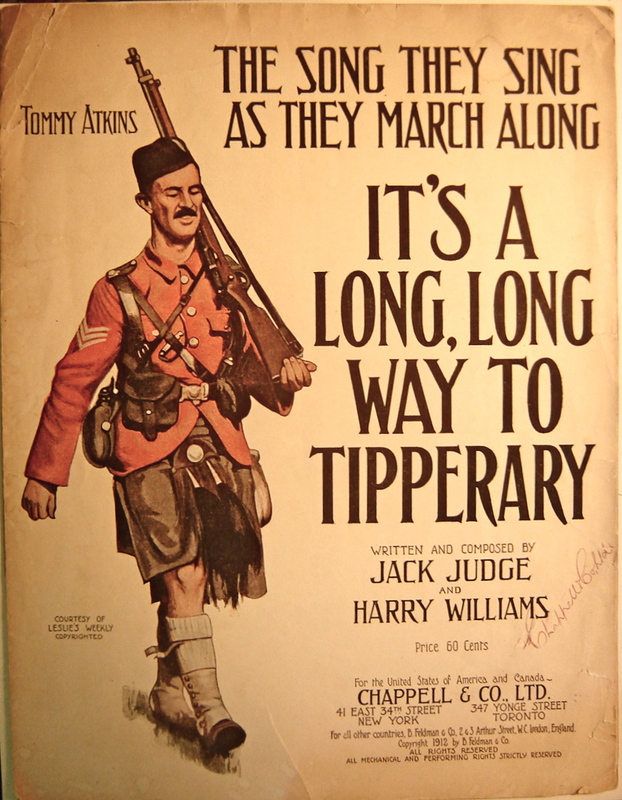 In 1915, when volunteer numbers began to decline, Music Hall began to roll out songs of enthusiasm and cheerfulness, some of which are still well known today – ‘It’s a Long Way to Tipperary’ and ‘Pack Up Your Troubles.’ This approach gave the people a way to laugh off the horrors of war and these upbeat tunes eventually transferred to the battlefield where British soldiers would sing them to keep up spirits. Scottish singer Harry Lauder was a notable figure for supporting those on the front line, visiting the troops frequently and writing ‘Keep Right On to the End Of the Road’ as an assurance of his firm backing, despite his only son being killed in 1916. It is clear that Music Hall played a significant role in wartime Britain during 1914-18; it found a way to efficiently recruit men, keep up spirits at home and on the front line – its music creating a legacy we still remember today. This page was added on 14/03/2017.